Some say the process of learning how to learn, is more valuable than what you learn. As founder of a digital experience optimization agency (roboboogie Inc.) who fell madly in love with digital marketing after earning a BS in Geology, this certainly rings true to me. By studying a natural science, I learned how to be a scientist and I now follow a scientific method to improve digital experiences. So, does that make me an experience optimization scientist? I hope so. I was reminded of this last week while attending Opticon, Optimizely’s annual gathering of CRO thought leaders, marketing executives and optimization practitioners. 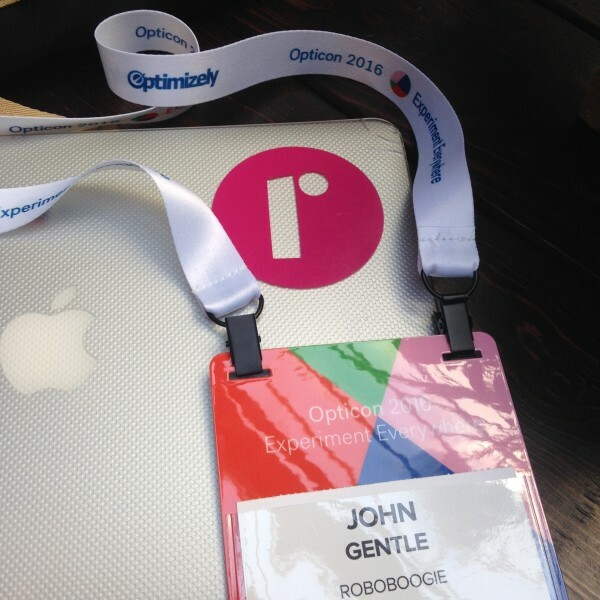 The highlight of the event was Optimizely’s announcement of their latest product, Optimizely X. Optimizely X builds on the solid foundation of its current A/B testing and personalization tools to create a comprehensive, cross channel experimentation and optimization platform. Optimizely X combines A/B testing, real-time dynamic product recommendations and content personalization, with full stack tools for experimenting on responsive websites, mobile apps, and even T.V. The product UI is intuitive, easy-to-use and a potential game changer for smart marketers looking to embrace the power of cross channel optimization. With the announcement, Optimizely is challenging brands to ‘Experiment Everywhere’, a challenge that we at roboboogie team take seriously, and practice daily. So, what does it take to be successfully optimization scientist and ‘Experiment Everywhere? I thought I would explore this idea by first identifying the attributes of successful scientists. Sure curiosity can kill felines, but it is also a powerful catalyst for innovation and progress; a critical starting point for any new hypothesis. Don’t be afraid question everything and test new ideas. Follow your curiosity, it might just lead you to a pot of conversion gold. Any methodology worth following takes proper planning, patience, and dedication to the process. Marketers must commit to securing skilled resources, frequently come up with new test hypothesis, design and build experiments, monitor them, allow enough time to gain statistical relevance and taking time to do a careful analysis. Phew. Now rinse and repeat again and again and again. Remember, good ideas can come from anywhere in your organization. Yes, even from your boss. A good scientist opens his/her senses to the surroundings, observes customer behaviors, and asks plenty of questions, while always being open to hearing the answers no matter how odd they sound. Do not force experiment results into a preformed opinion. Be honest with what you’re observing and learning. Not all experiments are wins, but you will always learn something valuable. Take time to analyze the results and use those learnings to inform your next experiment or make a positive change. Ralph Waldo Emerson once said, ‘Science does not know it’s debt to imagination’. Don’t be afraid to push the boundaries and try new ideas. Dig deep into your imagination. Head out to the desert to find you soul. You might be surprised with what you find out there. In optimization, many minds are definitely greater than one. Collaborating in cross-decipline teams gives you broader insights and fresh perspectives on new opportunities and discoveries you might otherwise fail to see. So, think you have what it takes to be an experience optimization scientist? I am certain you do, after all you discovered our blog. So, get out there, be brave and test everything. Thanks for the inspiration Optimizely. John is the Founder and Lead Experience Designer at roboboogie Inc, a Portland, OR based digital design and optimization agency. roboboogie is helping innovative brands such as WACOM, Nike, Specialized Bikes, Universal Technical Institute and The CLYMB.com significantly increase online sales and conversions.